Worked top down, these ankle socks have a really stretchy ribbed cuff that folds over, reminiscent of the school socks I wore as a child. A traditional heel flap is worked with gusset shaping. 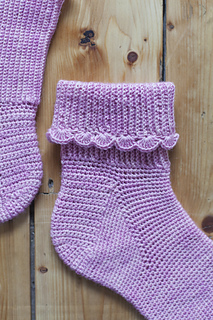 The socks are worked almost entirely in double crochet with a pretty cluster edge applied at the end. Gauge is given in Double Crochet worked in the round. Published as part of The Crochet Sock Collection.